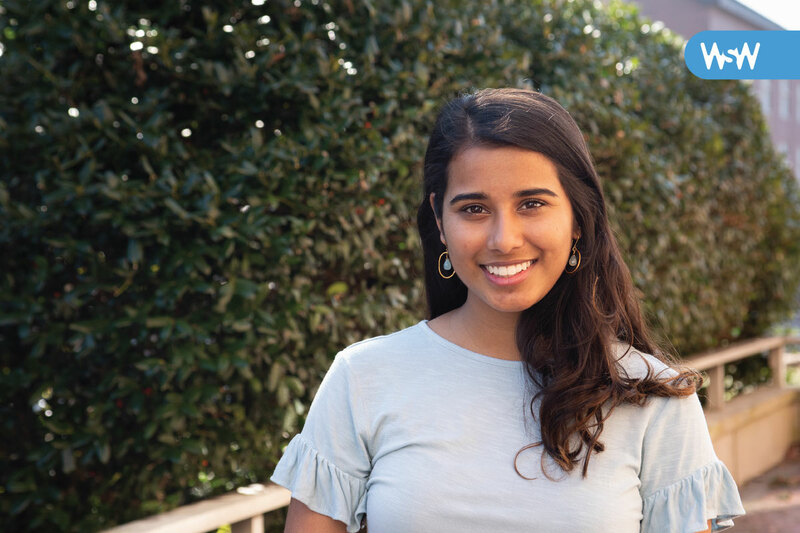 Aditi Adhikari is a junior and Morehead Cain Scholar majoring in public policy with a minor in chemistry within the UNC College of Arts & Sciences. Her most recent research project focused on increasing discussion about the impact and consequences of machismo, the attitude and acceptance of male superiority, on women’s health in rural Nicaragua. I had a bunch of dreams. I wanted to be an astronaut, a doctor, and also an author! I rationalized that by saying I was going to be a doctor in space and then write books about it. Even since I was little, I’ve always thrived in the spaces between different disciplines. Share the pivotal moment in your life that helped you choose your field of study. I haven’t yet pinpointed my field of study because I have so many interests that I often feel confused about what I should focus on. I’ve changed my major at UNC multiple times and am actually in the middle of a shifting my major now. The one thing that does stick with me no matter what I do is my curiosity when faced with a problem. Whether that’s in neuroscience, public health, economics, or public policy, I always try to immerse myself in research, ask questions, and learn something new. I hope that whatever field of study or career I choose to pursue in the future allows me to keep doing that! I think it is so important to have varied academic interests. It had always been my worry that academics are too siloed, even in fields that are relatively related to each other. We all have something to learn from other fields of study, and I think the most interesting work is done when minds from completely different disciplines come together. Especially in undergrad, I think it’s important to be as academically broad as possible so that you are constantly analyzing and learning from challenging, different ideas. You never know — a totally different academic field might have the missing piece to the questions you’re asking. Tell us about a time you encountered a tricky problem. How did you handle it and what did you learn from it? One of my favorite problems I’ve solved is the issue of improving engagement among volunteers in a nonprofit I work with called the Joyce Ivy Foundation. We have a huge group of 50 volunteer fellows that do everything from outreach to fundraising and writing blog posts, but we were having trouble keeping fellows engaged. I worked on a team with two other amazing ladies to identify the underlying issue, brainstorm solutions, and then implement a completely new and improvised organization system that streamlined our workflow, removed unnecessary bureaucracy, and clarified goals and expectations. This is the first year we’ve used the new system, and it’s going well so far. What are your passions outside of research? I love to hike and have completed many backpacking expeditions including one that was 23 days long! It’s definitely my favorite way to travel and decompress both in the United States and abroad. Women in Science Wednesday highlights UNC researchers at all levels of their careers across dozens of fields. From medicine to mathematics to sociology, women at Carolina excel in research, mentorship, and advocacy. Click here to nominate an exceptional scientist. This entry was posted in Society, Women in Science Wednesdays. Bookmark the permalink.